"It Never Did ME Any Harm!!" "It never did me any harm!!!" "In the middle of the room was a large box draped in black cloth and in austere tones the culprit was told to take down his trousers and kneel before the block over which I and the other head boy held him down. The swishing was given with the master's full strength and it took only two or three strokes for drops of blood to form everywhere and it continued for 15 or 20 strokes when the wretched boy's bottom was a mass of blood. Generally of course the boys endured it with fortitude but sometimes there were scenes of screaming, howling and struggling which made me almost sick with disgust. Nor did the horrors even stop there. There was a wild red-haired Irish boy, himself rather a cruel brute, who whether deliberately or as a result of pain or whether he had diarrhea, let fly. The irate clergyman instead of stopping at once went on with increased fury until the whole ceiling and walls of his study were spattered with filth." somewhat High Church character in the chapel." did me, morally, all the good in the world." The fact that this individual could not sit down without pain for days afterwards clearly indicates that the beating resulted in tissue damage. Nevertheless, like his latterday counterparts, the prospankers, this person, was keen to visit the sufferings of his own childhood onto the next generation. "It is news to me that a schoolmaster may not correct a scholar in a proper way. I have never heard of a summons against the headmasters of Eton, Harrow, or Rugby, or any of those schools for assault. The boys get swished for all sorts of offences at those schools. At least they did in my day, and I hope they do now." The fact that the perpetrators of this cruel maltreatment of helpless children never drew the attention of law enforcement agencies further underscores the social acceptability of bloody beatings during the period in question. Modern sensibilities recoil from descriptions of such corporal punishments, once considered harmless and beneficial by the majority. Yet the numerous voices raised in defense of such practices bear a marked similarity to modern-day apologetics for spanking. "I know that I was once whipped three times before breakfast, and I do not think I was the worse for it. I can honestly say that it had an extremely deterrent effect in my after career." As a contemporary pro-spanker might argue, he was whipped, and look how HE turned out. He became a minister of parliment! 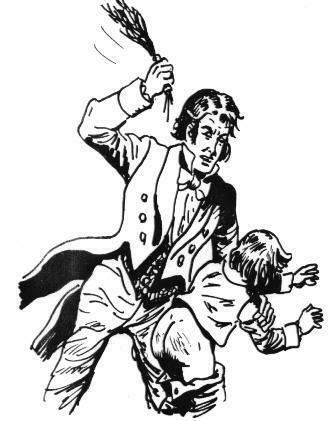 According to the logic of all-too-many adults now living, this would indicate that whipping a child three times before breakfast constitutes "good discipline." In conclusion, the evidence indicates that there is very little in the way of physical cruelty to children which certain adults will fail to defend, provided that they themselves suffered such cruelty at a tender age. Psychological mechanisms of repression, denial, and displacement of aggression account for the widespread willingness of former child victims of physical abuse to make light of it, extoll its virtues, and advocate its use on today's children. The words of those who testify to the harmless and beneficial nature of physical punishments visited upon them in childhood deserve little weight. They talk just like the pro-birchers of yore.